On November 3, 1978, the Ugandan army blew up the Kagera Bridge at the start of the 1979 Uganda-Tanzania war. After the Ugandan forces had withdrawn from Tanzania – having occupied her territory for about 30 days – Idi Amin ordered for retreat back to Uganda. In order to curtail the movement of Tanzanian troops advancing into Uganda, they decided to destroy the Kagera Bridge. Kifulugunyu was in the Malire Mechanised Specialised Reconnaissance Regiment (MMSRR) which had some of the best tank squadrons; and so witnessed and “participated” in the blowing up of the German-built Kagera Bridge. Speaking in Luganda, Kifulugunyu told Witness: “Enyonyi zalemwa okumenya orutindo. Nebaleta abakugu okuva e Kilembe Mines bebarumenya.” Loosely translated: “The jet bombers failed to destroy the bridge. So they brought experts from Kilembe Mines. It’s them who blew it.” While he recalls that the explosive experts were three in number, this reporter was able to establish that they were four – one Italian and three Ugandans. “When they arrived, they entered the water, to assess the foundation of the bridge. We were a group of four soldiers holding a rope tied around each explosive expert to prevent them from being swept away by the strong current of the river. From the basement of the bridge, the four experts connected detonators, which they pressed and the bridge was blown into pieces,” Kifulugunyu said. After the 1979 war, Kifulugunyu like all former Uganda army soldiers was imprisoned. But in 1980, he managed to escape with other ex-servicemen from Upper Maximum Security Prison, Luzira. For three years, he hid in Mubende District until 1984 when a one Kasinzi took him to the National Resistance Army (NRA) rebels. But on the day he arrived in the bush, Kifulugunyu was arrested. This was after he said he had been in the UA but had escaped from jail. “They couldn’t believe my story. They thought I was a spy. And I was detained in a trench for two days. With my guitar, I started singing for the prisoners.” After two days, I was set free and made the OC Morale. I liked the title. I started calling myself OC “omuraaro”. My major role in the bush was to entertain fighters,” Kifulugunyu says. One of his best compositions is the morale boost song “Omoto nawaka” one of the famous NRA rebel songs. 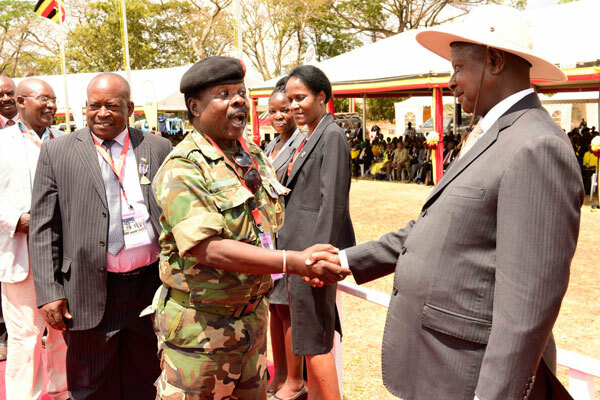 In 2008, at the rank of Warrant Officer Class I (WOI), obtained in 1973, Kifulugunyu was retired from the national army after 44 years of soldiering. Today, he ekes a living by selling NRA songs on CDs and films in Kampala. He blew our damn bridge. Inflicted a very serious faulty to our economy.